"Servantship is essentially about following our Lord Jesus Christ, the servant Lord, and his mission--it is a life of discipleship to him, patterned after his self-emptying, humility, sacrifice, love, values, and mission. Servantship is humbly valuing others more than yourself, and looking out for the interests and wellbeing of others. Servantship is the cultivation of the same attitude of mind Christ Jesus had: making yourself nothing, being a servant, humbling yourself, and submitting yourself to the will and purposes of the triune God. Since servantship is the imitation of Christ, it involves an unreserved participation in the missio Dei--the Trinitarian mission of God. 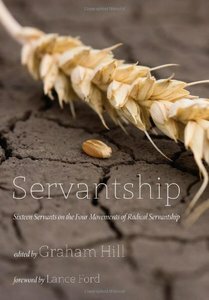 In this pioneering work, sixteen servants describe the four movements of radical servantship. Servantship is the movement 1. from leadership to radical servantship; 2. from shallowness to dynamic theological reflection; 3. from theories to courageous practices; and 4. from forgetfulness to transforming memory. Servantship recognizes, in word, thought, and deed, that ""whoever wants to become great among you must be your servant, and whoever wants to be first must be your slave--just as the Son of Man did not come to be served, but to serve, and to give his life as a ransom for many."" "
Graham Hill is Senior Lecturer in Applied and Pastoral Theology at Morling College in Sydney, Australia (a theological college affiliated with the MCD University of Divinity and the Australian College of Theology). He is the author of Salt, Light, and a City: Introducing Missional Ecclesiology (Wipf & Stock, 2012). Graham's ministry experiences include church planting, pastoring in a large growing congregation, and coaching pastors and planters of missional experiments. Lance Ford is the cofounder and director of Shapevine.com, and the former director of the Northwood Church Multiplication Center. With more than 20 years of experience as a pastor and church planter, Lance is a writer, coach, consultant, and an adjunct professor. Ford and his wife live in Kansas City, Missouri.